A powerful visual Web development tool. the easiest way to design and develop complex web pages. 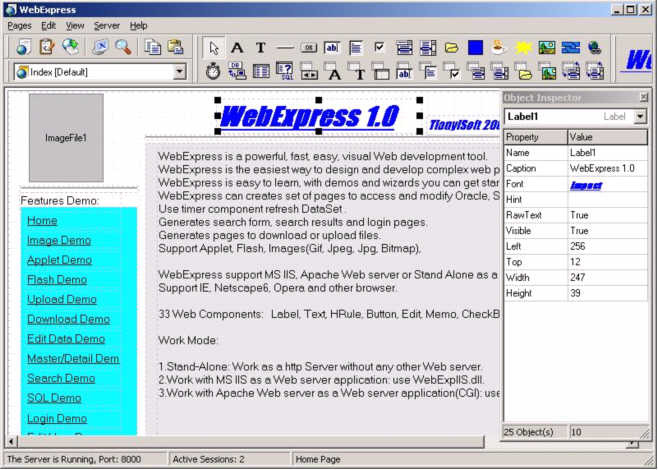 WebExpress is a powerful, fast, easy, visual Web development tool.It is the easiest way to design and develop complex web pages, largely automated with wizards, no more learning complex HTML commands and using those other complex and expensive HTML editors, no more learning programming. Just click point place and preview. So all is visual, fast, simple. WebExpress is easy to learn, with demos and wizards you can get started in just 5 minutes! WebExpress can creates set of pages to access and modify Oracle, SQL Server, Sybase SQL Server, MS Access, DB2, Informix, MySQL, FileMaker database or any other ODBC datasource or ADO datasource, add, delete, update, edit table records, execute SQL. Use timer component refresh DataSet. Generates search form, search results and login pages. Generates pages to download or upload files. Support Applet, Flash, Images(Gif, Jpeg, Jpg, Bitmap), WebExpress support MS IIS, Apache Web server or Stand Alone as a little Web server. Support IE, Netscape6, Opera and other browser.